Contour Brush to soften the line for a more smokey effect. Our Eye Pencils are formulated to be worn on the inner rim of the eye or along the lash line. Swipe our Black, Navy, Dark Brown, Smoke or Khaki along the inner rim for a precisely defined eye, or apply outside of the lash line and buff out for a sultry, smokey look. 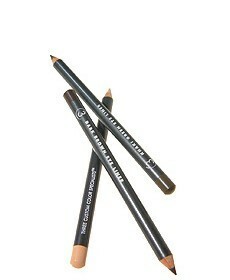 Our one of a kind Clarifier pencils are used on the inner rim of the eye to brighten and widen. As a rule, Light is great for fair-medium skin tones and Medium is great for medium-dark skin tones, but many of our clients have both - Medium for subtle definition and Light for more drama. Clarifiers are also great for highlighting under the brow and as a spot concealer in a pinch!